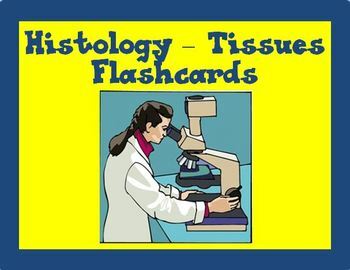 This set of tissues flashcards is great for reviewing histology, identifying tissues, and general tissues information. This product contains 2 sets of flashcards with 61 individual flashcards. The cards are designed to be folded, laminated, and cut. All sets can be mixed and matched, and copies can be made for extra sets depending on your needs. The first set contains 19 flashcards covering general review questions that go with my histology (tissues) unit. 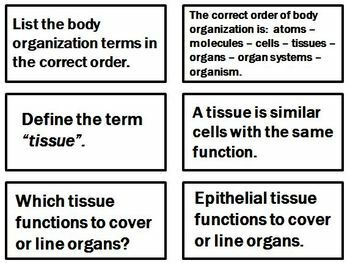 The second set covers 14 different tissues with 3 questions for each tissue (What type of tissue? How do you know? and Where is it located?) for a total of 42 flashcards. 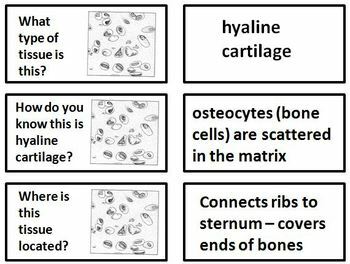 These flashcards can be used in an Anatomy/Physiology class and can also be used in Biology or Life Science. Great for any level student from English Learner - EL - to more advanced students. 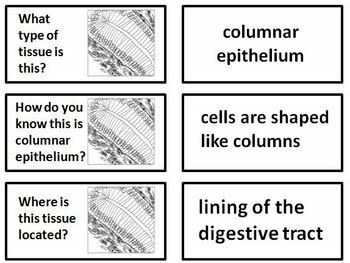 I use these flashcards as a review and it is a great way to get the students using academic vocabulary which is an important part of the Common Core standards. It is also a good way to get English Learners to expand their vocabulary. If you like this product please check back soon as we will be posting more in the near future. If you have any questions or concerns about any part of one of our products please let us know and we will be happy to work with you. Thank you!